Most of the images can be clicked to get a larger or original size. 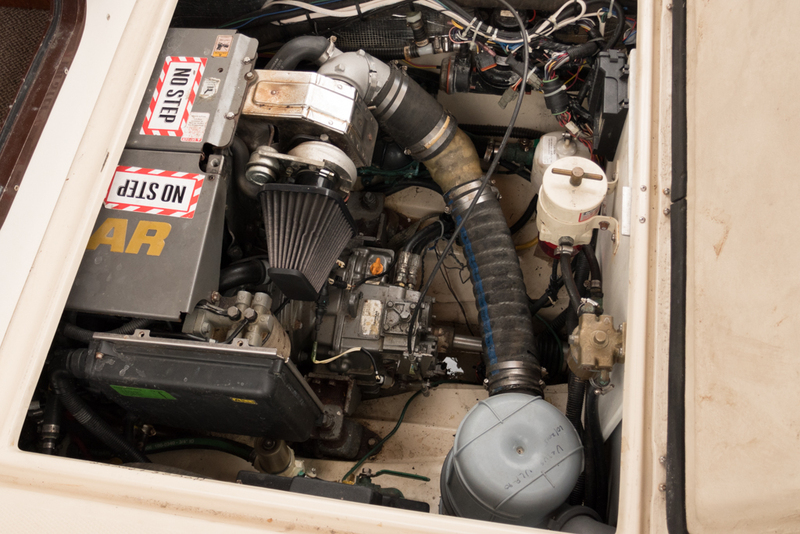 Our Ranger 25 is well factory equipped with a Yanmar 4BY2 engine (1000 hours), Garmin chartplotter with radar, a Mace 2.5 kW Generator (rebuilt 2018), new air conditioning (2016), range, and everything you might want to enjoy local cruising or the Great Loop. Click Here for a complete equipment list. 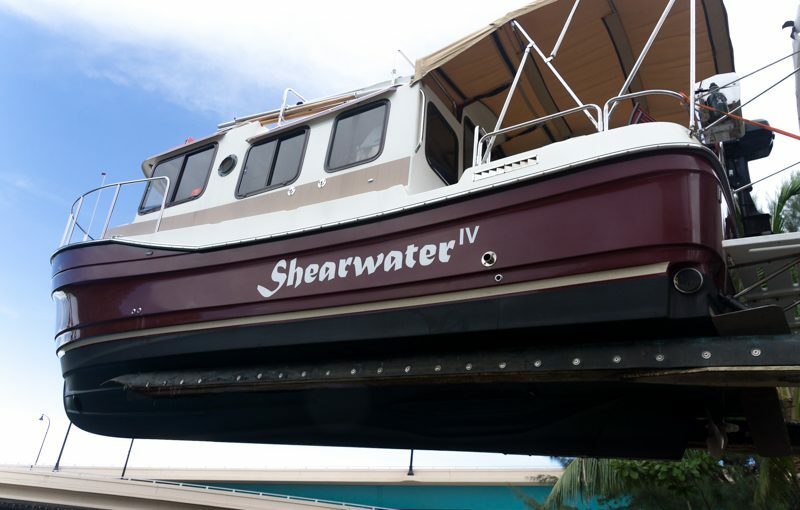 She “lived” for years at a family-operated dry stack marina in Deerfield Beach until rising water levels made it hard to get under a bridge and forced us to move to a slip in Delray. The folks at Pennell’s loved her as much as we do. She is washed each time we use her, waxed frequently, and kept in as near new condition as possible. Everything works! The interior was oxalic acid washed to remove the old oil when we “adopted” her. After removal, we stained the interior wood with teak stain to be the original color and applied several coats of polyurethane varnish. 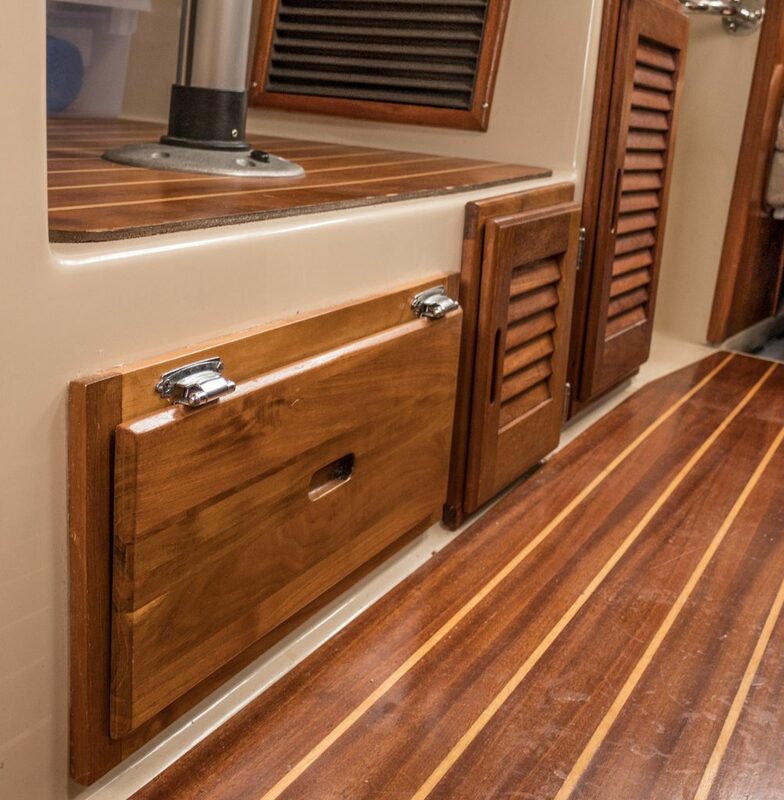 In the process, all the dirt and mold that builds up during the normal life of the boat was removed, and the fine teak interior was returned to the original appearance. 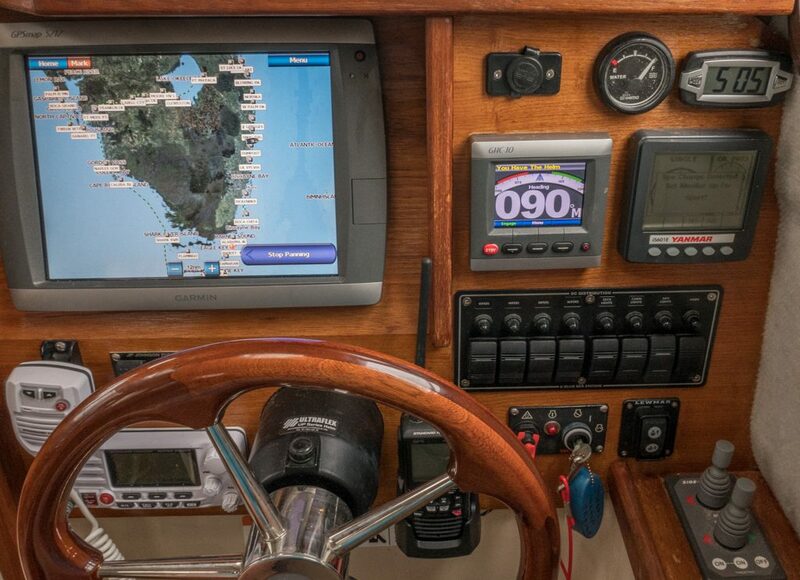 The console is well laid out, with a view of our last trip around the Little Loop on the screen in the photo, and each of the necessary instruments is convenient to reach. The VHF has been upgraded to include an AIS receiver and integrated with the chartplotter to show positions and names of nearby vessels. 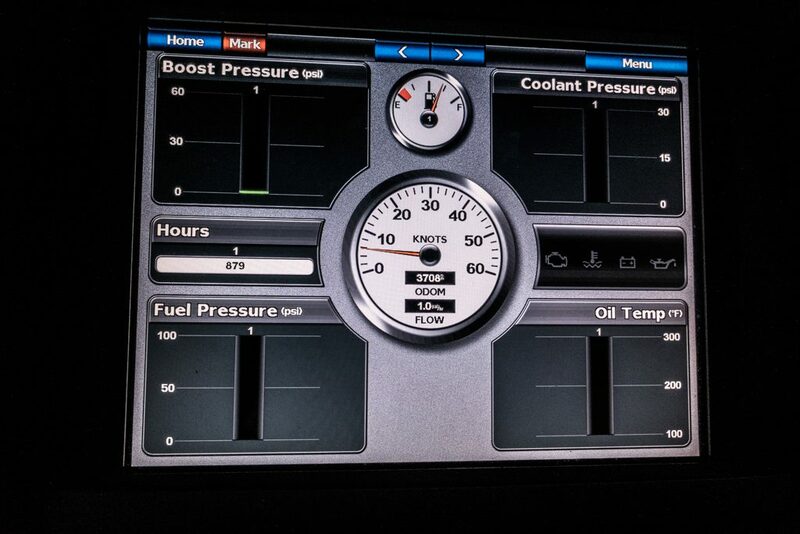 The chartplotter can switch, easily, to a variety of displays, In this case, it is showing the engine revolutions, the fuel level, and the hours on the engine. 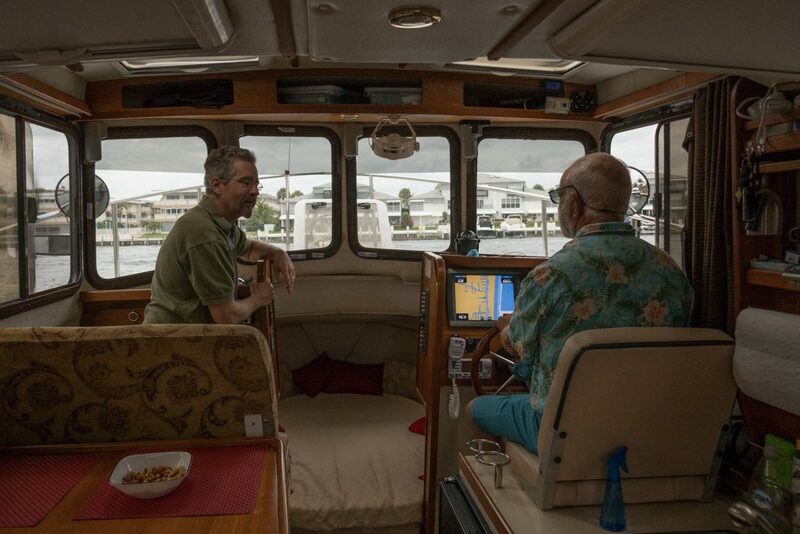 The view from the Bridge is excellent, all around comfortable from the helm and a generous Admiral’s station. The added front window tinting keeps the glare to a minimum without impeding forward vision. We augmented the factory storage with two additional hatches from the same vendor. They can be used to increase the storage or, when guests are using the lower bunk, to add some light and ventilation to their sleeping space. Visible in the background is the supporting leg for the table and the air conditioning inlet. We replaced the air conditioner with an identical unit in 2016. 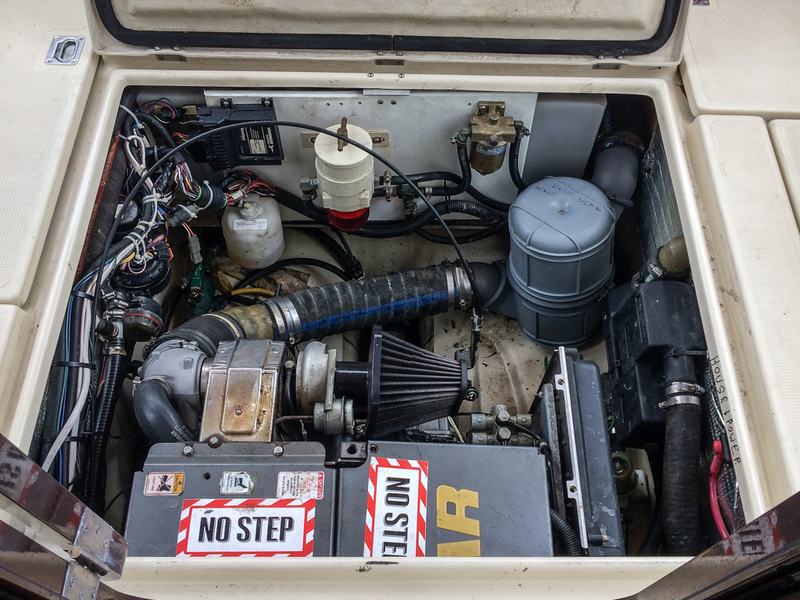 It cools the boat nicely and operates well on the factory Mace 2.5 kw generator (rebuilt in 2018). We replaced the sea water strainers on both the air conditioner and the generator with the next larger size so they would operate better in dirty water. The Shade Screens are our favorite addition to the boat. They provide a sliding combination screen and sun/light shade for all the hatches. Over our bunk, we start the night at full screen, sliding it as the evening goes on to avoid getting cold. 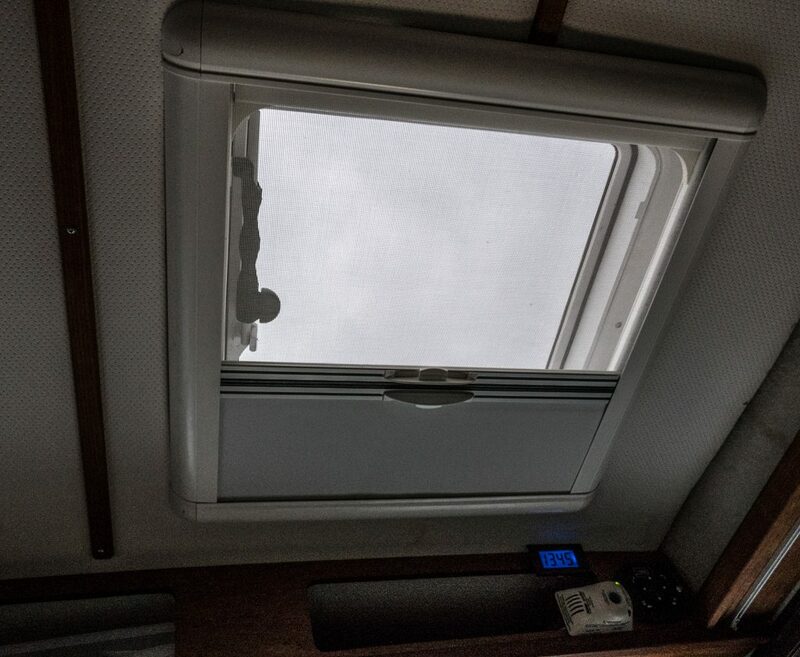 When we begin the day, we slide the shade almost shut with the hatch open and get some cool breeze without any sunlight glare. The integral screen in each hatch protects the part not covered by the shade. 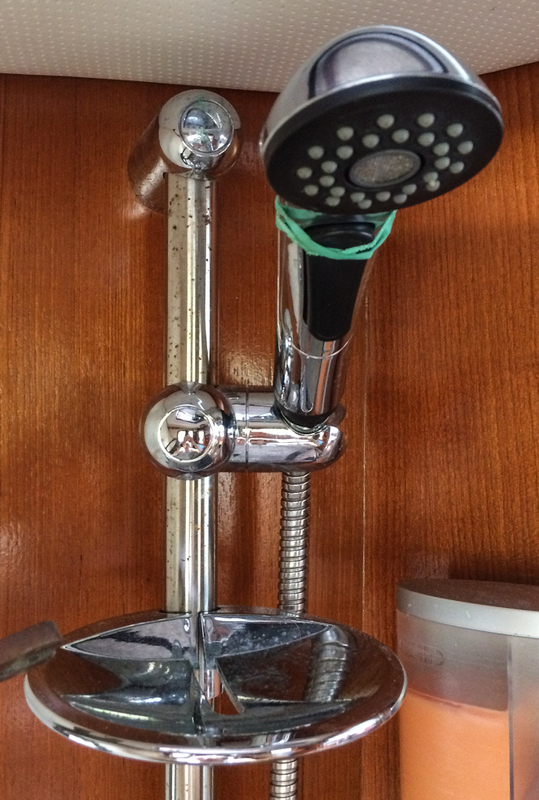 We use the shower on a daily basis. Over time our factory original teak oil finish began to discolor – as do all natural finish woods. The wood was bleached, stained, and sealed with several coats of varnish. I like the original soft glow of quality teak wood joinery. The surfaces look great and are nearly immune to the wear of daily use. Best, there is none of the moldy smell often associated with boats! 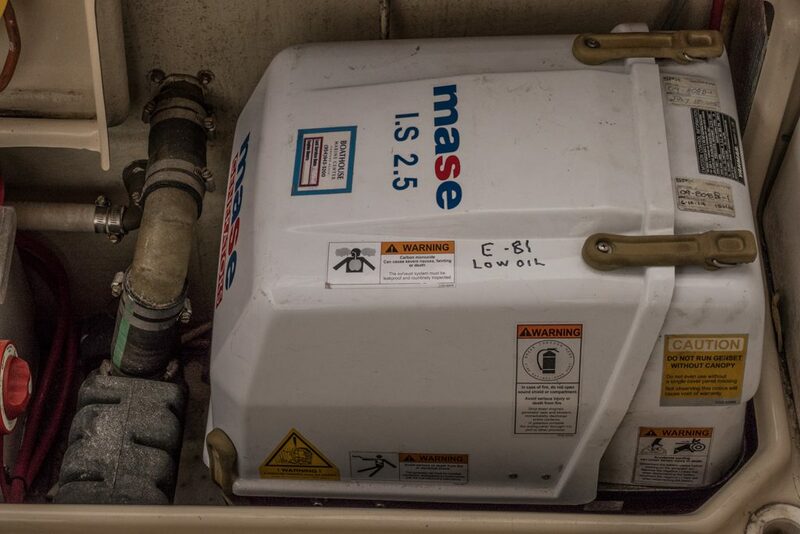 The Mace 2.5 kW generator was treated to a new engine in 2018. It starts and runs well. The generator compartment was heavily sound insulated when the unit was rebuilt. The 4BY2 Yanmar engine has been reliable, powerful at 150 HP, and fairly quiet. It drives the boat at an economical low cruise speed of about 7 knots and a moderately economical high cruise of about 14 knots with a top speed of just about 16 knots. It starts easily, is surprisingly easy to service, and we trust it. 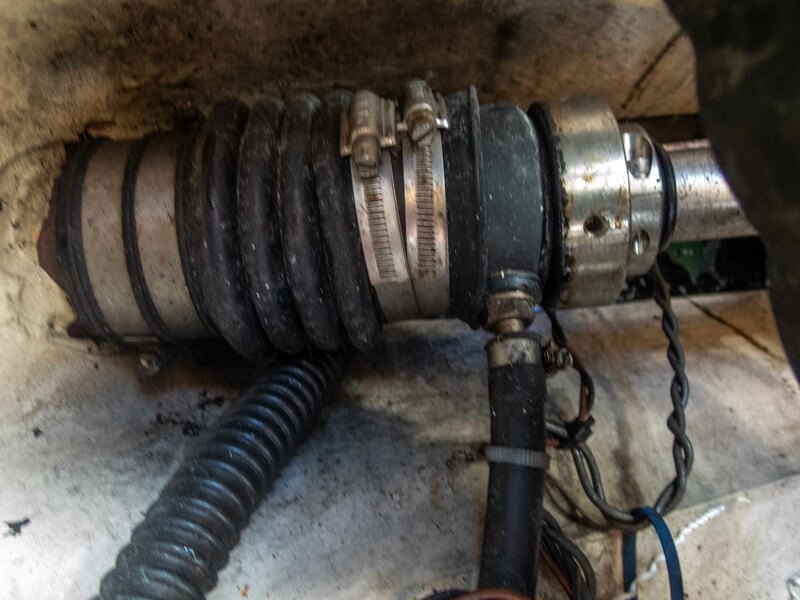 We have permanently corrected our engine’s occasional overheat problem caused by marine growth clogging the raw water system. You can read about the cooling problem correction by clicking here. 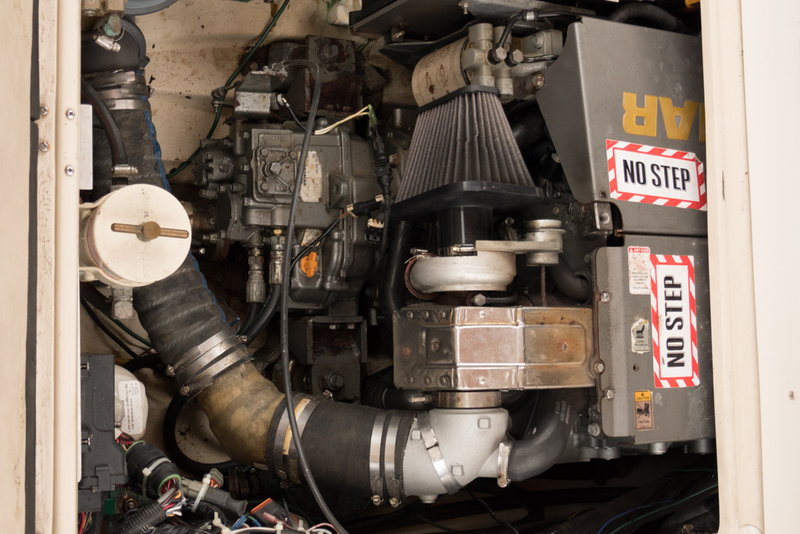 Both the engine and generator compartments have additional soundproofing to help control the Diesel noise. The house batteries were taken out of the Port locker. 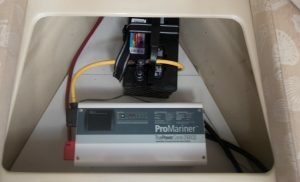 One was placed in the starboard locker and one was placed under the front bunk with the new inverter. The engine start deep cycle battery was replaced with a smaller starting battery. Larger batteries were used to give a total house capacity of 244 Amp hours. 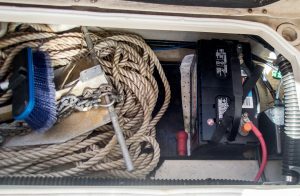 The inverter power cable from the previously dedicated inverter battery to the forward inverter was “repurposed” to carry the house load to and from the relocated forward battery. The thrusters are now powered off the house bank. When the engine is running, the normal case for using the thrusters, the two house batteries are connected to the engine start battery and the alternator by the factory installed Automatic Charging Relays (ACR). The ACRs give a total house and thruster capacity of just over 300 Ah and actually run the forward thruster slightly faster. In the process, the two non-standard thruster fuses were replaced with two easily reset Blue Sky circuit breakers. The result is nearly perfect trim and balance. Mid-range thruster adjustment brings the boat to a smooth, flat ride. Minor trim tab adjustment is required when only one person is on board. The trim tabs easily bring her to a level plane from about 9 or 10 knots and above depending on the chop and weather. They have been coated with Prop-Speed as has the rudder and propeller. 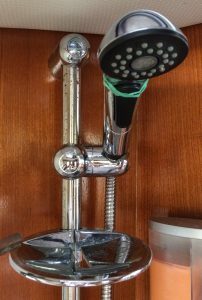 This reduces the need for underwater cleaning and improves the speed slightly. Early in our adoption of our Ranger, we developed a very slight leak in the shaft log, dripping just a bit faster than it should. Turns out, with about 400 hours, the packing needed renewal. We just could not get to the shaft to do the job. We determined to have the conventional shaft log replaced with the dripless shaft seal the previous owner had purchased but never installed. The yard removed the shaft, tested it for true (it was) and replaced the shaft log, charging us about 2 labor hours and saving me hours of pain from the twisting needed to remove the old seal. The unit, shown below, is about 6 inches long including the bellows that were reused in the installation. It has worked without a drip for about a drip for over 600 hours.